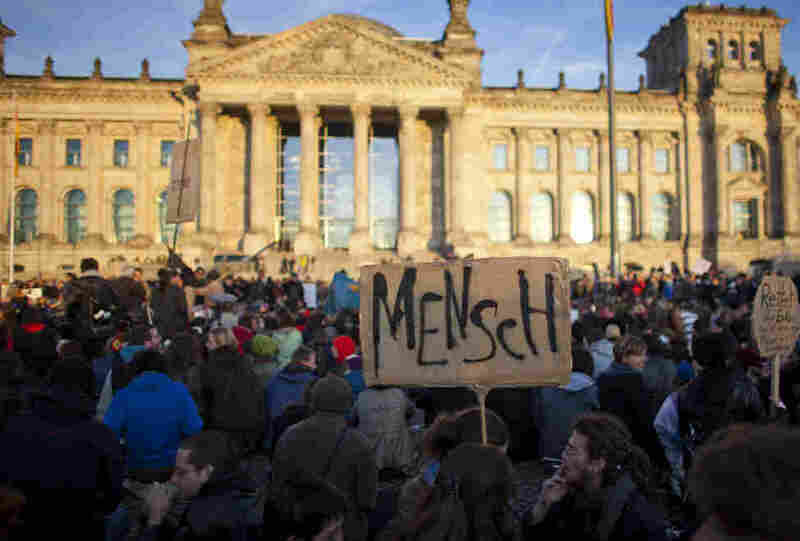 Occupy Wall Street Sweeps Through Berlin : NPR FM Berlin Blog This past Saturday, an estimated 10,000 protesters marched from Alexanderplatz to the Reichstag as part of the Occupy Wall Street protests that went global this weekend. Some 3,000 protesters occupied the Platz der Republik in front of the Reichstag this Saturday as part of the Occupy Wall Street demonstrations. The movement, which began in the US last month to protest corporate greed, has spread worldwide. "We'll stay here as long as we can. We shall have our voices heard." After just a few hours, Berlin police cleared the anti-capitalism protesters from their makeshift camp in front of the federal parliament building. Police initially allowed the sit-down protest but later stormed the crowd, confiscating tents and forcibly removing those gathered, using pepper spray in some cases. 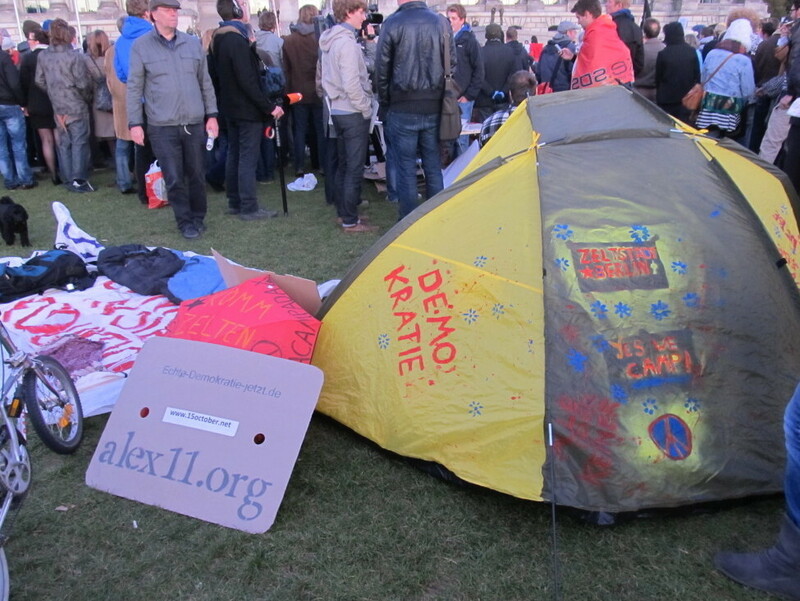 By late Saturday evening, protesters had erected tents or spread out cardboard boxes and iso-mats to sit on. Between eight and 10,000 people carrying signs calling for "Freedom for People, Not Money" and "Real Democracy Now" marched from Alexanderplatz to the Reichstag on Saturday as part of the occupy protests that went global this weekend. The Occupy Wall Street movement started last month when a group of die-hard protesters occupied Zuccotti Park in Manhattan's financial district to protest corporate greed on Wall Street. It has since grown to a much larger, decentralized movement that has swept the US and the world. Over the weekend, marches and occupations took place, and are still ongoing, in major cities such as Frankfurt, London, Rio de Janeiro, Sydney and Tokyo. By late Saturday evening, jovial protesters braving the cold erected tents or spread out cardboard boxes and iso-mats to sit on. Organizers doled out bread and homemade soup from food stations dotted around the camp to hungry demonstrators. They communicated using what was dubbed "the people's microphone." The crowd would repeat short segments of what the speaker was saying so those farther away could hear. At first, it all appeared somewhat disorganized, but the group soon came up with a plan and communicated what was needed: blankets, food and water, among other things. Miriam Gracia serves soup from from a mobile Vokue. 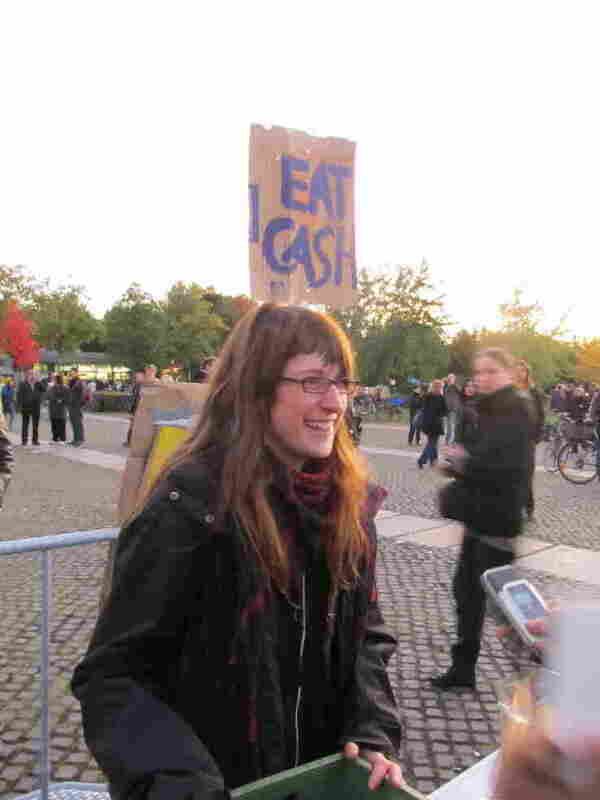 Miriam Gracia, from Zaragoza, Spain, served soup from a mobile VoKü, one of Berlin's ubiquitous people's kitchens. "We are doing a kind of VoKü offering food for people, and they can give a donation if they want, but it's free. There are a lot of people gathered here, and they will get hungry, and it's cold, so we have soup too," Gracia says. Various people from the crowd stood up and spoke about the need to end the dominance of the financial markets and money's stranglehold over politics. "We will remain peaceful," announced one speaker as the crowd relayed the message and waved their hands in agreement. Word about the protest itself had gotten around via the Occupy Berlin twitter account (@occupy_berlin), which is constantly updated, as well as the blog. The group is also live streaming the protests. Those attending the demonstration were there to protest a number of issues, apart from the financial crisis. Sean Hunter Williams, a sculptor from Vermont who has lived in Berlin for a number of years, wanted to show his solidarity with the Wall Street Protests. "I don't really know German politics and who Angela Merkel's cabinet is and if they work for Deutsche Bank or something. I'm here to show solidarity because I can't be with the people in New York or my home state, so I'm kind of finding people here, and they also want to show their support for people in the US," Williams says. He also says he found the protest a little unfocused. 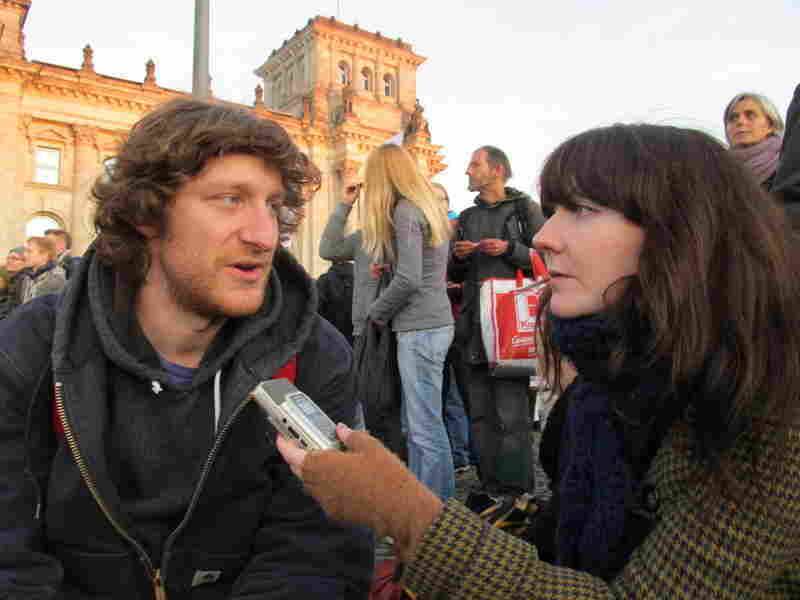 American Sean Hunter Williams participated in Occupy Berlin this Saturday to show solidarity with the Occupy Wall Street protesters in New York City. "There seem to a be a lot of issues – the environment, climate, consumption, human rights." Indeed, much criticism has been levied at the Occupy Wall Street movement for its seeming lack of focus. However, molecular medicine student Leon Straub, a member of the social-democratic students' organisation, Sozialistisch-Demoktratischer Studentenverband (SDS), believes issues such as climate change and education are tied in with money's influence on politics. "The protest behind us is about the dictatorship of the financial institutions and against the power of Wall Street and the Frankfurter Börse. We know the government in this building behind us has very close ties to the private financial system. One of Angela Merkel's main advisers is Josef Ackermann, the head of the Deutsche Bank. This connection between politics and the banks influences all these other issues," Straub says. Straub believes the protests need to move beyond assembling in public spaces and into universities and the workplace. The SDS is trying to organize at universities and is also involved in reforming third-level education to make it more democratic. Karol Keane, from Ireland, has been living in Berlin for three years. Having studied his Masters in globalization, he remains, in his own words, somewhat cynical about the protests, although he sees them as a positive step. "It's really good that people are actually stepping up ... If it does nothing but create dialogue, it's a very positive thing. This stuff needs to be talked about. The system is rotten to the core. The rich are getting richer and the poor are getting poorer, and therein lies the major problem in the world at the moment," Keane says. Dominic, from London, who met Keane at the protest, agrees and believes the system needs to be radically overhauled. "Grass roots social movements and mass demonstrations are the only means by which the state can be revolutionized." By the time the last of the demonstrators were removed on Saturday night, a decision had already been made to occupy the Platz der Republik again on Sunday following a march from Rotes Rathaus to the Reichstag. On Sunday, following negotiations with the police, the assembly was allowed to take place. Protesters will now gather every day at 3 pm in front of the Reichstag. A larger protest is planned for October 30th.